“We are constantly telling ourselves a story of who we are and where we are going.” So begins Jennifer Brea’s brilliant documentary. At this early moment, I realised that Unrest would both document Brea’s experience of Myalgic Encephalomyelitis (ME) / Chronic Fatigue Syndrome (CFS) while also providing many thought-provoking insights into life and its value. Brea began filming her struggle with ME after her doctors suggested there was nothing wrong with her and that her symptoms were “all in her head”. Frustrated and trying to make sense of things, she started a video diary on her iPhone. This diary, which eventually became a film, shows in moving and often upsetting scenes the true nature of this debilitating illness. As a result, Unrest informs us about and raises awareness of ME/CFS. Brea hopes that by sharing her experiences “we can build a movement to transform the lives of patients with ME; accelerate the search for a cure; and bring a greater level of compassion, awareness, and empathy to the millions upon millions of patients and their loved ones wrestling with chronic illness or invisible disabilities”. Unrest is also a powerful story of love. The love between Brea and her husband, Omar, is emotionally affecting and inspiring. Their active lives and dreams for the future were crushed following Brea’s diagnosis - leaving them both struggling to come to terms with their new reality. Despite their desperate situation, the couple are both incredibly resilient and forward thinking - always trying to find answers. What causes ME? How long has this illness been around? Is there a chance of a cure or, at the very least, a way to mitigate the symptoms? When it affects so many, why is there so little funding for research? For, of course, Brea is not alone. This is both a comfort (she can chat to fellow sufferers and compare notes online) and a shock. Unrest shows us what life is like for some of Brea’s friends and contacts - many of whom have disappeared from their own lives - and we are left shocked too. Unrest is a powerful, informative and moving film. Brea is incredibly brave - letting us see her at her most vulnerable. Her journey is inspiring and, despite the many challenges that she faces, there is a clear message of hope. Unrest is now available to watch via Netflix. Unrest is one of the augural films to be released with the support of Sundance Institute’s Creative Distribution Fellowship which empowers entrepreneurial Sundance filmmakers navigating the changing business of independent film. 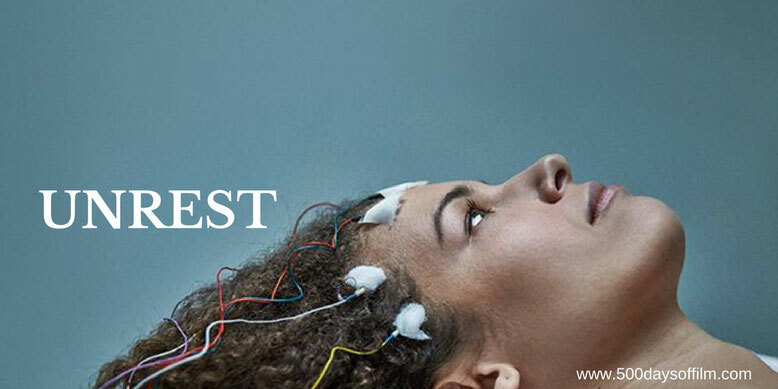 Have you seen Unrest? If you have, what did you think of this film? Let me know in the comments section below or via Facebook or Twitter (@500DaysOfFilm).